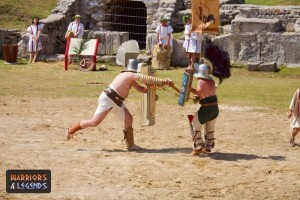 The murmillo gladiator was a very general type of occupant in the Colosseum due to their standard weaponry and shield. They were initially created as a gladiator class when the relations between Rome and the Gauls at the time grew more fruitful. The new murmillo gladiator easily replaced the gaul gladiator class to reflect the growth of the Roman/Gaul relationship. In battle the murmillo would often fight one of two other gladiators, the thraex and the hoplomachus. Both of these gladiators shared a common trait they were often equipped with Greek weaponry and armour, and thus with the murmillo tooled like a Roman legionary it was a reflection of the battle between Greece and Rome. Think of a classic image of a Roman gladiator in your head, and you’re likely thinking of a murmillo gladiator. Their iconic look is typically the style that most people associated with the brave Roman gladiators. The mighty murmillo gladiator stands ready for his next battle. The singular weapon of the murmillo gladiator was that famed roman sword the Gladius. The gladius sword was well tested and the standard issue of the roman army, itself very similar to the Greek swords from earlier history. To use this sword effectively was probably second nature for a murmillo, with thrusting actions a primary attack method with a gladius, aiming for the stomach, or even the legs. The gladius was also double edged meaning it was able to slice and cut as well, and a skilled murmillo gladiator would be able to use this weapon for various attacks on their opponent. Armed with a large Roman shield, the Scutum, the murmillo was in a good position to deflect blows from any foe with ease. The large scutum was the common shield used by the Roman legionaries, and while heavy it was very strong and capable of affording the murmillo to adopt an interesting style of fighting. As was also common with gladiators was the helmet, and the murmillo also had one, specifically classed as the Cassis Crista, a heavy often bronze helmet that had a fine grill to protect the face from any bladed attacks. The murmillo leaps forward with a sword strike on his foe. In addition to their shield and helmet, this gladiator class also wore a manica on their arm, typically made from leather, fabric or metal, it would protect their weapon arm ensuring they would still be able to strike and defend with some protection. To top off their outfit, the murmillo wore shin guards known as Ocrea. These guards were typically made from metal and would protect the rather delicate shin area from all manner of attacks. The murmillo was a gladiator that was often matched with many other gladiator types, including the thraex, the hoplomachus and even the retiarius. With a large shield and heavy helmet the murmillo gladiator was typically strong and powerfully built. Their strength would make it easier to manouver the shield in position to defend themselves while striking back with their gladius sword. Because of the size of their large rectangular scutum shield, the murmillo was often a patient fighter. They would be able to use their scutum to protect themselves from more aggressive and lightly armoured foes like the thraex and the hoplomachus who both had a much smaller shield. 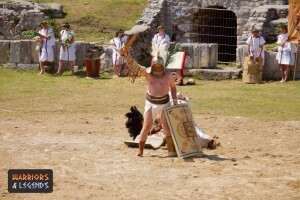 A murmillo gladiator stands victorious in the ampitheatre. As they were suited to defensive attacks if their foe was to over commit on an attack the powerful murmillo would be able to launch an effective couterstrike with their gladius. Additionally if anyone tried to get too close, the murmillo could use their powerful upper body to push them away using their shield as a buffer, hoping to knock their enemy off their feet. The murmillo gladiator is pretty much the visual representation of what most people think of when the word gladiator comes to mind. Armed with a roman sword and shield, and wearing leg and arm greaves, the look of the iconic murmillo was topped off with the gladiator helmet known as the Cassis Crista. The murmillo also served that purpose of almost being the favourite home town champion, often fighting against the gladiators with Greek weaponry and armour, allowing their battles in the Colosseum to be truly engaging for the massive crowds.